Government Funeral Benefits, Social Security Death Benefit, Veterans Death Benefits, Florida National Cemetery. Each eligible spouse will receive a $255.00 death benefit. Upon death, our office will notify the Social Security office and explain the claim process to you. All veterans do not receive benefits. The veteran was injured in service and was receiving service connected disability compensation. The veteran died while on active duty. The veteran died in a V.A. hospital or a V.A. nursing home facility. 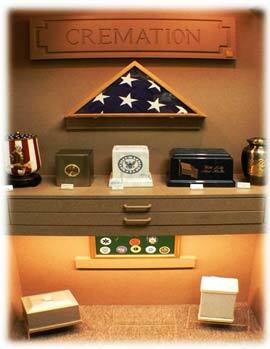 Each eligible veteran is entitled to a flag and burial in a National Cemetery. All honorably discharged veterans and their spouses are entitled to burial or cremation space without cost in this beautiful facility located just 25 minutes from our funeral home. In addition to free graves, the cemetery will also provide free grave opening and closing, free markers, and free cement burial liners for casketed remains. A copy of the honorable discharge document is needed for our staff to make these arrangements.